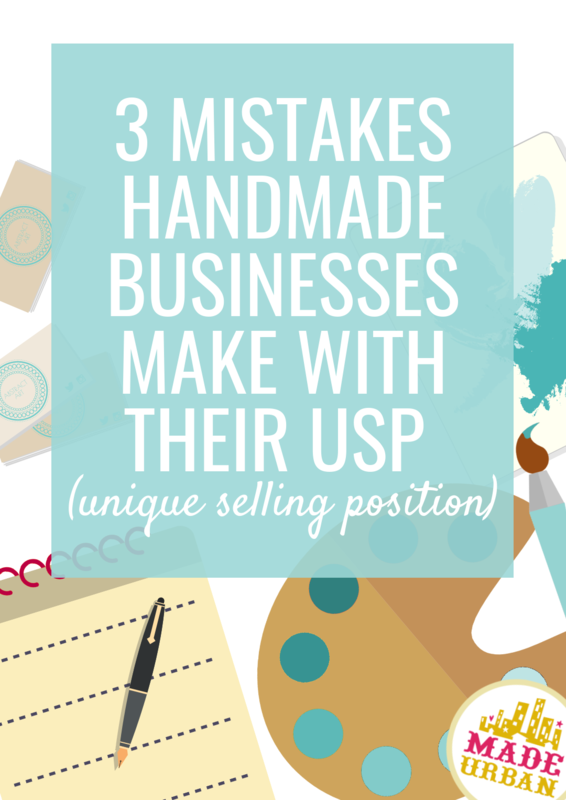 A USP is a unique selling position and should be considered an important aspect of your handmade business. Starbucks vs. Dunkin’ Donuts , Pepsi vs. Coke, Lululemon vs. Nike; each company is selling something very similar to the other so they must have a product feature that stands out or market their products in a way that lets consumers know they’re offering something different. Having a compelling USP is an important piece of the consistent-sales-puzzle. Can you sell products without a USP? Sure. But will you sell more with a powerful USP? Absolutely! It’s one more component that makes the difference between shoppers stumbling upon your products at a craft show, on Etsy, your website, etc. and making a sale here and there vs. driving shoppers to your products and having them purchase again and again. 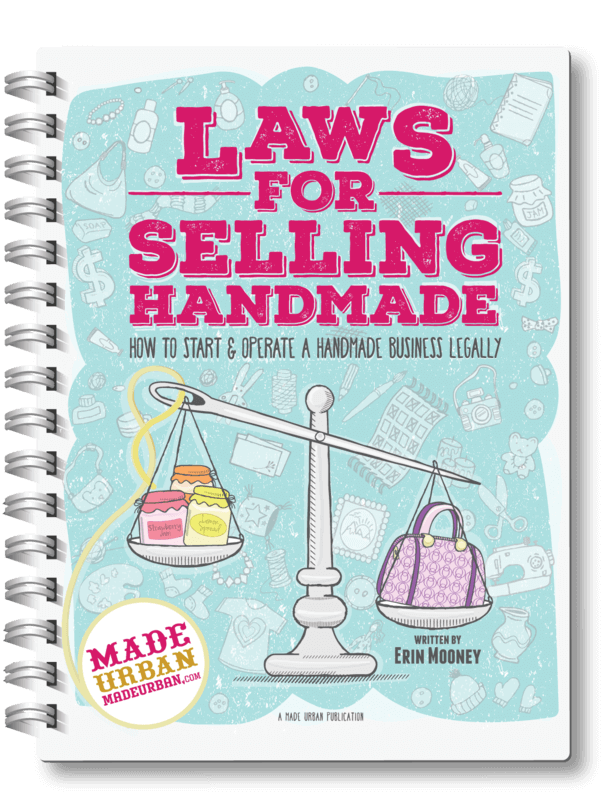 I cover coming up with a USP fully in HOW TO SELL HANDMADE BEYOND FRIENDS & FAMILY and get you started on finding yours in the free 5 day challenge BEAT LAST YEAR’S SALES. If you’re making any of the mistakes mentioned in the article, the free challenge and ebook will be good tools for you. The number of truly unique products on the market is very low. Unless you’re inventing a product no one has ever heard of, your product probably isn’t that unique. And if it really is unique and you can’t find a single business out there selling something similar, it may mean there isn’t enough demand. You DO NOT have to come up with something that has never been done before in order to make sales. In fact, I’d encourage you NOT to. “Never been done” or “can’t find it anywhere” means you’re blazing your own trail. That’s very challenging, time consuming and expensive. Marketing a product that no one else is selling means you must build a new bandwagon, get it moving and encourage enough people to jump on it that they keep the momentum going and tell others about it. Piggybacking on the popularity of a product that has been done makes for a much easier ride. And instead of adding an unknown element, combine another popular element to come up with something unique or put your unique spin on it. For example, if choker necklaces are popular, a jewelry vendor doesn’t have to come up with a never-thought-of-before choker design or start a completely new necklace trend. Instead, they could take the popular choker style and combine it with the popular geo shaped crystal trend, adding a geo-shaped pendant. Or they may add their unique style by creating goth versions of a choker. Or, if their style is on the feminine side, perhaps delicate chokers for brides or bridesmaids would be a fit. Your USP must keep your target market in mind and that target market should be a LARGE existing target market. You can’t invent a new group of people interested in everything from traditional and elegant bridal designs to bold gothic statement pieces. A customer is either drawn to delicate pieces or bold gothic pieces but very rarely both. You can however find an existing group of people interested in traditional bridal jewelry (Brides magazine, The Knot blog, House of Brides online store, etc.) OR gothic jewelry (e.g. Gothic Beauty Magazine, La Carmina Blog, Rebels Market online store, etc.) and create products for ONE of them. Take “unique” in USP as offering something that’s for a specific group of people (that actually exists and not just a group built around a product that you’re hoping exists) and has less competition. There are thousands of companies selling regular soap, but vegan soap for animal lovers has less competition. There are millions of “farmhouse” home decor products but less competition when you focus on masculine farmhouse decor for men interested in interior design. There are millions of knitted slouchy hats and infinity scarves but not many made for the male baby/toddler hipsters. Need help determining which existing and profitable target market you should go after and crafting a powerful USP? Join my free 5-day challenge: BEAT LAST YEAR’S SALES. “Handmade” or “one of a kind” is NOT a USP. Every handmade vendor’s product is “handmade” or has an element of being one of a kind because of the inconsistencies created when a product is made by hand. “Handmade” is also not the main reason a consumer buys a product. If you put a product in front of someone who doesn’t need it but it’s exactly their style, has a cool brand or makes them feel they’ll regret not buying today because it will gone and hard to find tomorrow, they’re more likely to buy. Are much more encouraging selling points than “handmade”. Your USP’s purpose is to point out the benefit to the customer. “Handmade” makes a product awesome, but it’s not the benefit. If the handmade element truly is the benefit, then “high quality”, “customizable” or “ethically produced” would communicate the perks more clearly than simply stating “handmade” as the benefit. A benefit clearly tells the consumer what’s in it for them. “Handmade” does not do that. Those who frequently shop handmade may understand all the benefits but most people don’t think “that makes my life so much better!” when they hear “handmade”. What will make shoppers clearly see the benefit of your products? 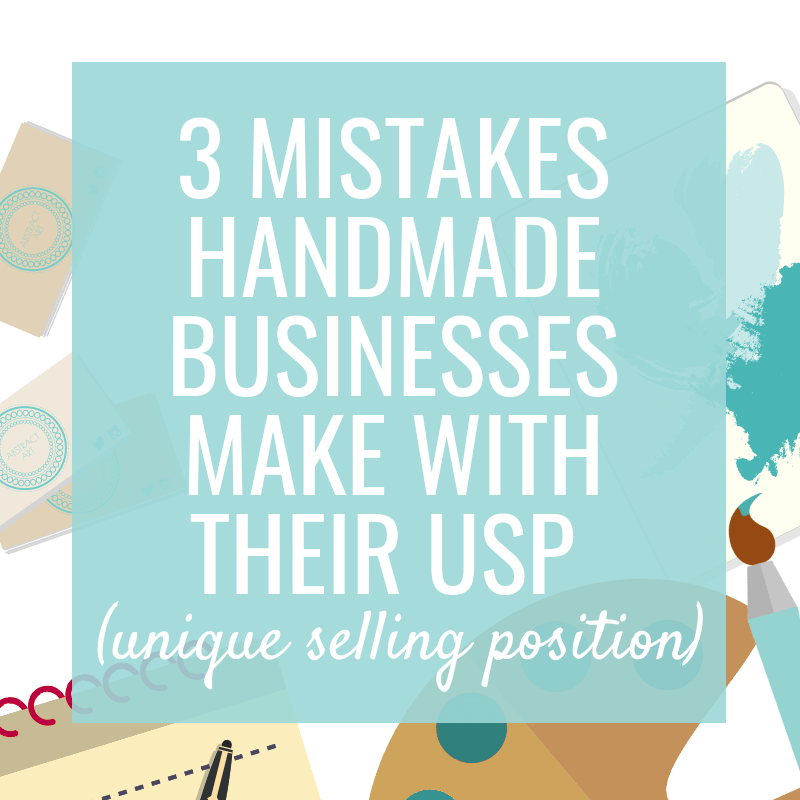 Not taking the time to craft a powerful USP is a mistake many small business make. But a mistake that’s even more common is not taking the time to create products that have a unique angle. If you want to run a successful craft business that stands the test of time, you should be constantly brushing up on your skills to move beyond the basic crafter and to offer something not every crafty person can make. Or create something that’s specialized/niche enough that every big box store doesn’t carry it. Handmade businesses are gaining popularity because they’re simple and cheap to start (as outlined in LAWS FOR SELLING HANDMADE), don’t require a lot of startup capital or years and years of training. That means more competition for you. LOTS of people know how to sew, knit, put beads on a string, etc. so there’s no urgency for consumers to buy from you if they can easily find a similar item at any craft show, on Etsy, etc. But if you really dedicate yourself to your business and invest in training to learn new skills, research new trends, become a branding expert, etc. it becomes easier to find that unique angle that’s not already covered by every knitter, sewer, jewelry maker, etc. Once you find that angle, stick with it. Offering one vegan bar of soap for animal lovers among 20 regular bars of soap or offering one gothic choker among hundreds of beaded, leather, feminine, bohemian, etc. necklaces, earrings and bracelets doesn’t build a strong brand, mass followers or a loyal audience. Once you determine your unique selling position, don’t forget to communicate it! Your USP should strongly influence your branding and come through in almost every aspect of your business. Not sure how to come up with a sale provoking USP or how to apply it. It’s all covered in HOW TO SELL HANDMADE BEYOND FRIENDS & FAMILY. Not sure if HOW TO SELL HANDMADE BEYOND FRIENDS & FAMILY is for you? Join the free challenge BEAT LAST YEAR’S SALES for a sample and a few key lessons from it. What’s your USP? Share what you sell and your unique selling position in the comment section. If you can’t put it into words or clearly communicate it in a sentence or two, your USP may need some work. I create hand carved, blockprinted 100% linen tea towels. I also custom design blocks on commission for printing on the tea towels, or small throw pillows. I’d like to expand to include tablecloths and napkins and runners to have a broader price range. But all on 100% linen and all my own blocks. My designs are a direct reflection of my personality; quirky, whimsical, maybe a little odd! How’s that sound?? My usp needs work, but I’m getting there. I’m closer now than I was 6 months ago! That’s great to hear Beth! Hi Kathi! Your tea towels sound awesome 🙂 A quick suggestion that might help with your USP is focusing more on your ideal customer and what’s in it for them. They may not understand the benefit of “all my own blocks” or maybe even why 100% linen should matter to them. Who are you making your tea towels for and what’s the best reason they should buy your them instead of another business’? A bit of a tougher question to answer;) but it’s key to uncover what your consumers truly care about and communicate it. Hi Erin! At 5 Elements Jewellery I hand-pick semi-precious stones, sea glass and shells, and wrap them in strands of precious metal to create highly distinctive jewellery, inspired by the elements and hand-crafted with heart. Does that sound ok? It has taken me a while just to get to this point! Thanks, Erin! I guess “my own blocks” isn’t really a selling point! I’ll do some research on why I choose linen over cotton. I can see that being a pretty good point. I personally just love the feel of the linen, but that’s not going to sell it. Some of my designs are focused mostly on our locale, Maine, so that’s a selling point, as we are a high tourist community. The ‘who’ would mostly include women in the kitchen, plus, when I add the table cloths and other table linens, it would expand to folks who entertain and want to have a unique, Maine inspired table setting. Is that closer? Your book and timely articles help keep me from losing my mind! That’s so great to hear Nancy! Thanks for your support and good luck at your upcoming events! Hi Lorraine! That’s a good start; I would try to work more of your ideal customer in. Who is going to wear your jewelry? What type of style do they have? What’s the benefit of buying your semi-precious stone jewelry over another vendor’s? That’s great Kathi, I think you’re getting closer! I would challenge you to think about your ideal customer more and really narrow in on who your products are perfect for. Because “women in the kitchen” applies to everyone (we all go in the kitchen right? ;) as does “people who entertain” (most of us entertain once and a while). How would you describe “Maine inspired”? But more importantly, how would your customers describe their home décor style? That’s how most people shop for tea towels or table linens. Maybe “Maine inspired” translates into Cape Cod style or nautical style? Someone wants to update their table linens or purchase new tea towels; what do they type into a search bar that brings them to your products? What specifically are they looking for? You don’t have to spell out who your towels are for (e.g. tea towels for middle aged women who like to cook) but rather include an aspect that they’re most likely to identify with when purchasing your product, which might be loving nautical decor. Making artisan dog treats in the Italian tradition with simple natural ingredients, love, and, compassion. Hi Erin! My sister and I both used to have creative businesses and then took about a 10 year break to have lots of babies lol. Now we’ve decided to collaborate by making and selling under the name “Blythe House 1860” (named after my historic home). We have a clear idea of what we want to create but have had a hard time expressing it in clear, concise words. We make a variety of heirloom, timeless pieces, from children’s toys to home décor, with emphasis being on the fact that anything we create is reusable, heirloom quality that can be passed down through generations. Although we make a lot of different items, we’re hoping to brand a “lifestyle” rather than a product…does that make sense? We’re hoping to inspire a creative, simple, and hospitable way of life and our ideal customer is someone that values quality, simplicity, and beauty over “fads” and just more “stuff”. Lol, see? It’s hard to put down in words! We’ve really made use of all of your extremely helpful articles! Thoughts? I like the way you’ve phrased that; a lifestyle brand. It may help if you can communicate the benefit consumers will care about most when it comes to your pieces. What will tug at their heartstrings (or purse strings;) the most? I did not recreate the “wheel” but instead used a 1944 farmers’ bulletin and made it in my own brand/style. It did take a bit of time to figure out how I wanted it to gather and be my style instead of just copying the exact apron. So, my USP is a “Gathering Apron for the Urban Gardener”. I’m still working on the “who” that I’m working for. But I really appreciate all of your input. You’ve really made me think, and that’s a good thing!! Thanks so much for your feedback! That helps! Rich – those dog treats sound great! One angle you may consider for your USP is the benefit that “simple natural ingredients” mean to the dog. For example “so your dog can eat like a member of the family”, “caring for what you put in your dogs body, just as you do your own”, “for a healthier dog digestive system”, etc. Kathi – Glad I’m making you think;) Your comments have made me think too so I appreciate you taking the time to write. I’m working on a mini ebook to help explain the exact steps to creating a powerful USP and am having to challenge my thinking to uncover what makes a USP great and sale provoking. Keep me posted as you uncover your “who”. My very first tradeshow will be this month and your worksheet has helped get the ideas flowing and give me some direction for what I want. Thank you so much. My photography is a reflection on the simple beauty of the world and the small moments that make a big difference. I create tiny books of photographs that focus on the little things in life. Thanks for reading! “one of a kind” doesn’t make for a strong USP because it doesn’t share the benefit. Most consumers aren’t that concerned about being the only one in the world to own an item. It may help to think about the target market your products are for or the specific style your jewelry falls under. I make liquid Showergel bath bar soap , and laundry liquid. I just can’t get the words into paper. I can customise the soap to suit different people and I use high quality and certified organic ingredients too. I only use sustainable vegetable oils, no synthetics, high quality or organic essential oils. Ensuring that my soaps do not add to the burden of the dep lotion of our environment by not using palm oil. Holistic health and Conservation is a passion of mine and I may be one person but any small changes are better than none. It may help to think about who your customer is and what they care about most. Are they an environmentalist? Share the benefit of your soaps being good for the environment. Are they strict about what they put on their skin because of the impact it has to their health or on their sensitive skin; point out that benefit. For craft shows I make several crocheted items – goldfish in a jar (“No Fuss, No Flush Fishies”) crochet and macrame earrings and necklaces and keychains. I also sew zipper pouches. Sounds kind of random but I will be suggesting Christmas giving, think stocking stuffers, for most of my items. The USP however, is that for the most part I use materials that no one wanted (gathered from estate sales, second hand stores, etc.) into unique gifts no one else has. To state that clearer – almost everything I make uses leftover, discarded or unwanted yarns, threads and fabric. Think the stash your Granny had that no one knew what to do with when she didn’t need them anymore. I have learned so much from your blog/e-books. Thank you for sharing them . I am making jewelry for professional women in early 30s that work in the corporate markets, trendy and chic, mid level income, single, focused on career, loves to travel, and gin and tonic with cucumber and has girl friends that live similar lifestyle. Great job defining your ideal customer! I think that “Scandinavian style” or “Produced in Bali” may be a part of your USP, but not all of it. It tells the consumer what makes your products different but not why they should care about them. How does buying jewelry from you, benefit them more than buying from another vendor? It’s not easy to find these answers but that’s why they deserve your attention. Once you find a valid USP, it impacts your entire business and creates clarity. Hi Erin, Your articles are amazing. I can always learn a thing or two from you. My jewelry is aimed at the working woman, ones desiring to procure a higher position. I am a firm believer in dressing to fit the position you desire. My USP says: Take your look a step up. Add Sparkles accessories to show quality and uniqueness. Get noticed! What do you think? Thanks so much for your support! What I thought as I read your USP is: I wonder what her jewelry looks like. That may be another helpful tip as you refine your USP. How would you describe the style or look of your jewelry? As it reads right now, I’m not sure if your jewelry is a fit for me. Most people do wear jewelry to refine their look and even to be noticed. So if you can get more specific about how your jewelry specifically does that and who it does it for, that may also help. You don’t necessarily need to use “workingwoman” but the fact that your jewelry is for a working professional doesn’t quite come through yet. And what type of working professional? Do they wear a suit? Colorful dresses? A uniform and can only personalize it through accessories? I hope that helps…USP is a tough one to nail down but it’s worth it! I have yet to even do one craft sale or trade show and am hoping to do my homework before I even get started. There’s many things I love to create so narrowing it down to something that’s not too broad of an assortment while still giving myself some options for a bit of change is going to be my issue… How does this sound?? In a world where we constantly strive to earn more, buy more, have more, why not step back from the frenzy and create a space in your home that is less busy, less cluttered and more relaxing? We aim to do just that by creating simply styled functional products to help bring a sense of “natural” order and minimalist charm to your home. I’m not sure what you sell. “simply styled functional products” could mean a lot of things. Are you selling home decor? Kitchen accessories? Also, who are your products for? You don’t have to come right out and say “for men aged 30 – 40” but are you targeting a bachelor, parents, working woman? There may be a way to work that in, such as “…minimalist charm to your family home” or “bachelor pad” or “small space” (signifying it’s likely a single person). Describing products as “masculine” or “feminine” can also help communicate if men or women tend to purchase your products.